A mindset is a belief about yourself and your basic traits relating to your intelligence, talents and personality. An individual may hold a fixed mindset or a growth mindset. A fixed mindset is a belief that traits are fixed and cannot be influenced nor increased. A growth mindset is a belief that traits can be cultivated through attention and effort. Believing that your qualities are fixed, or can be cultivated, leads to a host of thoughts and actions that carry an individual down entirely different paths of growth and development (Dweck, 10). The students of grade 7 began their year learning about mindset. Angela Watson is a Christian, wife and educator. She has created a 10 lesson unit on Growth Mindset. Grade 7 began the year in this curriculum. We explored the terms, definitions and practical applications of mindset. We learned the difference between a fixed, and a growth mindset. We identified our responsibilities in our own learning and contributions at WCS. We became aware of, and put to use, language that develops and supports a growth mindset. 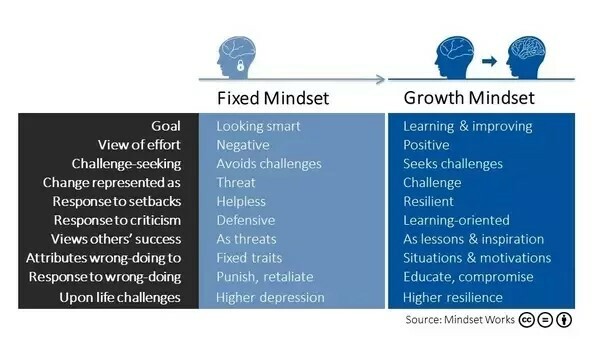 The following visual is helpful in distinguishing between how a fixed, and a growth mindset, responds in a learning environment (www.quora.com). Most importantly, we learned what God’s word instructs us about how he created us and how he desires us to think in order to grow and flourish in his will.